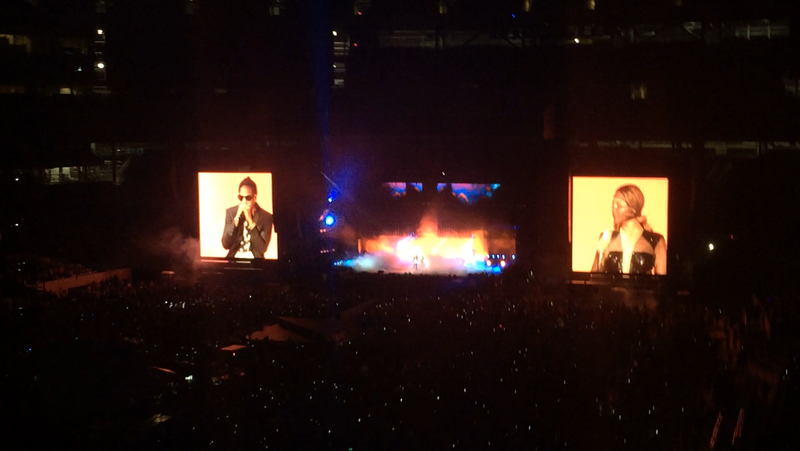 A few days ago I made an impulse decision to see Jay Z and Beyonce in concert. I had been wanting to go since I found out they were touring together but I wasn’t sure how I would get to New Jersey and if I would be allowed to spend a lot of money on a ticket. When my roommate Callie said she got a ticket and I conveniently found a seat directly in front of her I felt like it was fate. I bought my ticket online and didn’t look back (or at my bank account). 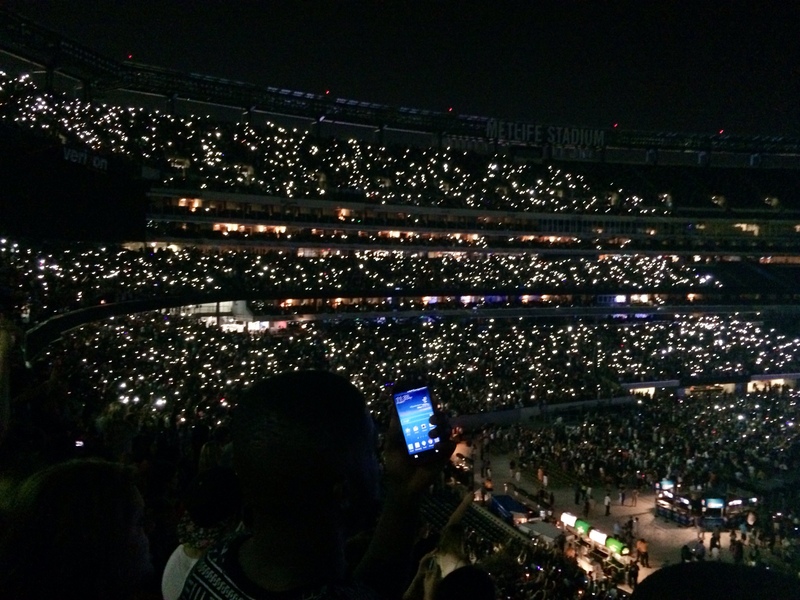 The ‘On The Run Tour’ concert was last Friday in East Rutherford, New Jersey in the MetLife Stadium. It was a bit of a trek to get there but I would travel great lengths to see Jay Z and Beyoncé in concert. We were running late and grabbed a smoothie and salad on our way down to the subway. We had to go from the subway, to the train station, then to a tram just to get out to the stadium. We ended up missing the first train so we flew through Penn Station to catch the next one. A little nervous that we didn’t buy tickets, we hopped on the train and found some seats. I began to eat my gourmet meal on my lap but only got five bites into it before I had had enough. It was one of the strangest salads I had ever had and it’s probably because it was from a juice place that specializes in smoothies, only. It was some sort of kelp salad with carrots and other weird stringy ingredients. I was too excited to eat anyways, I was about to see Beyonce, the queen herself, in concert! 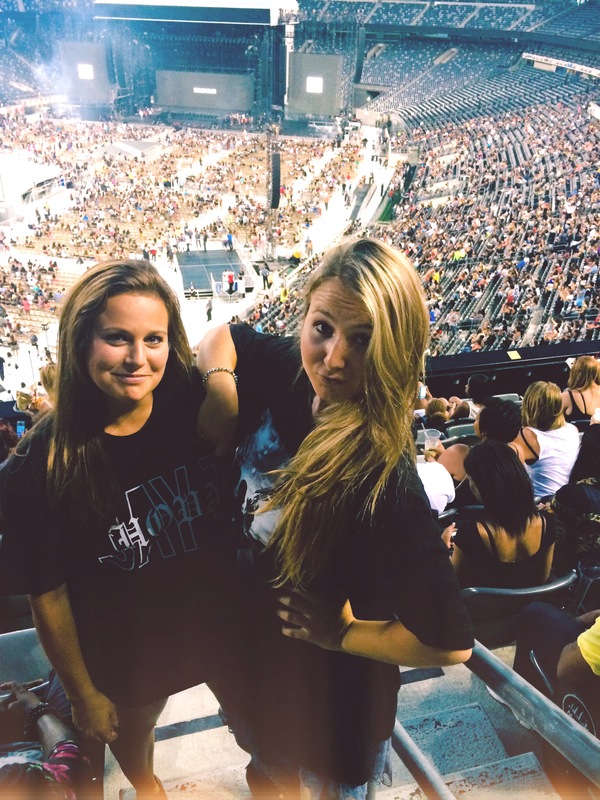 Callie nor I realized that the concert was being held in a football stadium. She thought it was at an area in NY and I just didn’t put two and two together when I read MetLife Stadium because I wasn’t familiar with it. Turns out, its the stadium that the Giants and Jets play in, which is pretty freaking cool. Our seats were in the upper level but weren’t bad for last minute purchases under $200. It felt like it took a year for them to come out on stage but when they finally did it was amazing. They entered together in killer outfits and just stood in the middle of the stage with the fiercest looks on their face. The first song they sang was “Bonnie & Clyde” which got the entire arena pumped for the concert. 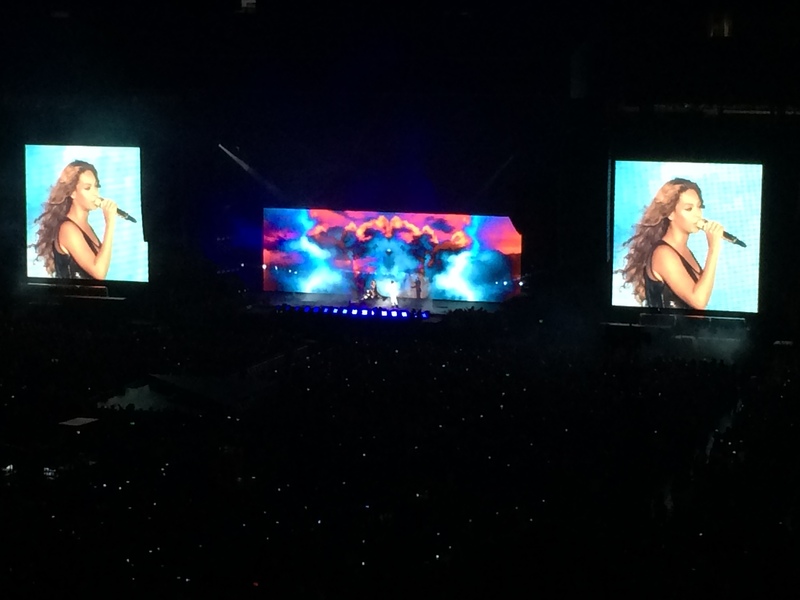 The concert was unreal and was like three concerts in one because I got to hear only Beyonce songs, only Jay Z songs, as well songs they’ve done together. It ranged from “Single Ladies“, to “Big Pimpin“, to “Drunk In Love.” It was everything from pop to rap and from the early 2000s to music that is currently playing on the radio. In other words, it was everything I ever wanted and more. I came to two grand conclusions from the concert. One, Beyonce is the most beautiful human being ever and can sing and dance like no one I’ve ever met and two, as much as it breaks my heart to say, Jay Z and Beyonce are definitely getting divorced. They hardly interacted on stage and my friends and I were convinced that the songs they played were very carefully selected and arranged by one another. Beyonce would sing, “But I’ll be damned if I see another chick on your arm” then right after Jay Z would sing, “I’m on to the next one, on to the next one.” Beyonce also sang “If I Were A Boy” after Jay Z’s “99 Problems.” The entire time I just got the feeling that it was one “screw you” song after another. Try watching this clip from the concert for more proof. I’ve never heard the song but all it is is Beyonce straight calling Jay Z out for cheating. She also changed the lyrics from “been ridin’ with you for six years” to twelve years, which is the exact amount of time they’ve been together. Fast forward to about 3 minutes and you will see exactly what I mean. Overall though, the concert was absolutely amazing and I would go to it every night if I could. Beyonce really is the queen and even though I’m bitter toward Jay Z, for cheating on Beyonce, I still love him and his music. Beyonce and Jay Z please don’t get divorced because you guys are the best power couple I have ever witnessed and I love the two of you together. Just stay together for Blue Ivy, and me. On my walk out of the stadium I realized I had seen five huge artists perform within 24 hours. And people wonder why I want to permanently live in New York so badly.